AT&T’s exclusivity in being the only iPhone carrier in the US is going to end in a few months when rival service provider Verizon starts selling the smartphone with CDMA technology. It was already a common speculation that a huge number of iPhone users who are not satisfied with AT&T’s service would instantly switch to any other company with a better network if given a choice. Now there’s proof. 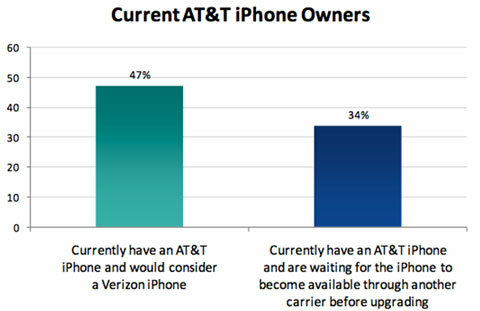 According to a new survey by market research firm Morpace , 34 percent of AT&T iPhone owners are waiting for the iPhone to be available on another carrier before upgrading, and a full 47 percent of current AT&T iPhone owners say they would consider switching to Verizon. So almost half of AT&T customers surveyed are not completely satisfied with AT&T’s network. Morpace surveyed 1,000 consumers, and 29 percent (across all carriers) said they are likely to buy a phone from Verizon. Of those, the majority (51 percent) are existing Verizon customers. This is no doubt a big number and if it indeed happens, it’ll shake up the market. It might also mean trouble for the Android market as currently Verizon is the biggest Android phones seller and if 51% of its customers switch to iPhone, it’ll be a major downfall for Android.